eBay's mobile app for iPhone makes selling on eBay ​faster and easier than it's ever been before. If you're new to mobile apps or the iPhone, however, the thought of posting an entire eBay listing using your phone might be a bit daunting. Follow along with the steps in this guide and see how simple the process can be. 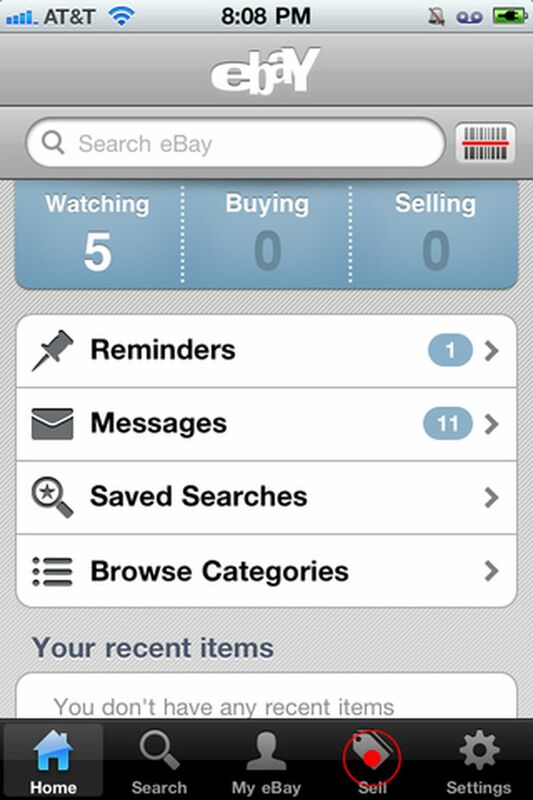 From the eBay mobile app's home screen, tap the 'Sell' button to visit your seller account. On your seller account screen, tap the 'List your item' button to begin the selling process. If you are selling a very common retail item with an intact UPC symbol or barcode on it, tap 'Scan your item' to attempt to scan the barcode and have eBay automatically identify your item and fill in parts of the listing for you. Carefully aim your phone's camera directly at the barcode on the item or the item's packaging. When the phone is able to read the barcode, it will automatically move on to the next screen—no need for you to intervene. If eBay successfully identified your barcode, you'll see that the listing title, category, and description have been filled in. As you follow along in subsequent steps you'll be able to edit these. If eBay wasn't able to identify your item based on its barcode, not to worry—everything needed for a successful item listing can be entered by hand, and you'll see how to do this in the steps that follow. Tap in the 'Listing Title' box and enter a title for your listing. This title should include the make and model of your item as well as basic (in one or two words) condition information like new, used, mint condition, and so on. Remember to carefully select your title so as to maximize your visibility in search results. Tap the 'Category' box to begin the process of selecting a category for your item listing. After tapping the category button, you'll be shown a long, multi-level list of the categories available to eBay sellers. Tap on the category that best fits your item to show a list of subcategories within that category. Repeat this process (selecting the category from the visible list that best fits your item) until a check mark appears in the box you most recently tapped. Then, tap 'Done' to accept the category and continue with the listing process. After selecting a category, scroll down in the listing form until you see the square icon that looks like a camera and that is labeled 'Photos.' Tap the icon to begin to add your first photo. After tapping the camera icon to add a photo, you'll be given the choice as to whether you want to take a new photo or select an existing photo from those stored in your phone already. Tap 'Camera' to take a new photo of your item using you iPhone's camera app and automatically add the resulting photo to your listing. Remember as you do this to pay attention to the quality of the photo you take. Tap 'Photo Library' to browse through your library of existing photos and select one of those to be added to your item listing. One you've taken or selected your photo, you'll be shown a 'Move and Scale' editor screen that asks you to trim and/or zoom your photo for use on eBay. Pinch-zoom in or out to size your image, and drag the light square area around until you've selected the area of the image that you want to appear in your listing. When you have the right image size and crop selected, tap 'Use' to save the image to your auction listing and continue. You can continue to add photos by typing in the square photo boxes on the listing form. When you're done adding photos, tap in the 'Description' box to open the description editor, where you'll either add to or edit the existing description (if you successfully scanned a bar code) or enter a description for your item from scratch. As you key in your item description using the iPhone keyboard, remember to ​​be as complete and helpful as possible in your item descriptions, though they'll necessarily be shorter when using the mobile app than they would be on a computer. After editing your item description and tapping 'Done' on your iPhone keyboard area, scroll down in the listing form and tap the 'Condition' box to begin the process of specifying the condition of your item to buyers. After tapping in the 'Condition' box you'll be shown a list of item conditions from which to choose. Select the one that best approximates the real condition of the item you're selling. After you select an item condition, you'll be taken back to the listing form. After you supply condition information for your item, select a listing format for your sale, either by tapping the 'Auction' button for a timed auction listing or by tapping the 'Fixed Price' button for a listing that ends when the item is sold. After entering the listing type, enter pricing information as appropriate—a starting bid and optional Buy It Now price if you chose an auction format listing, or just a Buy It Now price if you opted for a fixed price listing. Now, scroll down in the listing form and tap the 'Duration' button to select the duration for which your listing will run. Select a duration from the list of choices offered to you. After making your selection, you'll be taken back to the listing form. If you want to schedule your listing to begin at a future time instead of immediately, tap the 'Schedule' button to open the date and time selector and schedule the auction listing's beginning time. If you opted to tap the 'Schedule' button to schedule your listing for a future start, select the time and date for that start now using the selection wheels shown by the app. If you opted not to schedule your listing for a future time, skip this step. Tap the 'Add Shipping Service' button to add shipping details for your item so that buyers know how long it will take to arrive and how much shipping will cost. After tapping the 'Add Shipping Service' button, select the shipper you'll use to ship the item to the winning buyer/bidder and the amount that you'll charge them to ship this item. For free shipping, put a '0' in the 'Cost' box and eBay will automatically highlight the fact that you offer free shipping. After entering shipping information, scroll all the way to the bottom of the listing form and tap the 'Continue' button to go on. The app will pause for a few moments to upload the images you've chosen or taken to eBay and perform a few other housekeeping tasks. As it does this, a progress bar is shown near the bottom of the screen. You'll now be shown a screen on which you're able to verify the details you've entered. Use this opportunity to check the photo(s) you uploaded, read through your description and terms, and ensure that this is indeed the auction listing as you want it to be posted. If you need to make changes, tap the 'Edit Listing' button to return to the listing form and make further changes. Otherwise, tap the 'List Item' button to either post your listing immediately to eBay (if you opted not to schedule it for a future time) or to schedule it to appear at the time you previously specified (if you opted to schedule your listing for a future time). A few moments after tapping the 'List Item' button you'll see a final confirmation display from eBay listing any errors that eBay found and giving you one last chance to abort. If you choose to proceed, your item is listed and eBay displays a confirmation dialog that gives you the item listing number and a button that will take you directly to the listing. That's it—you're done and your item is for sale!